Uzbekistan lies at the heart of the Great Silk Road. For centuries, oases of Samarkand, Bukhara and Khiva brought respite to the caravans as they made their way across the desert. A tour through this country immerses you in the essence of the progress of civilization as it moved west. Today, Uzbekistan preserves this heritage while striving to bring its largely rural, historically nomadic populations better lives in a post-Soviet world. Slightly larger in area than California and with a population of 26 million, Uzbekistan contains more than half of Central Asia’s people. Known as the ‘sunny republic,’ Uzbekistan is arid with annual rainfall between only 4 and 8 inches. But its heavily irrigated river valleys make it the second largest cotton exporter in the world. It also contains important mineral resources and is a world leader in gold production. 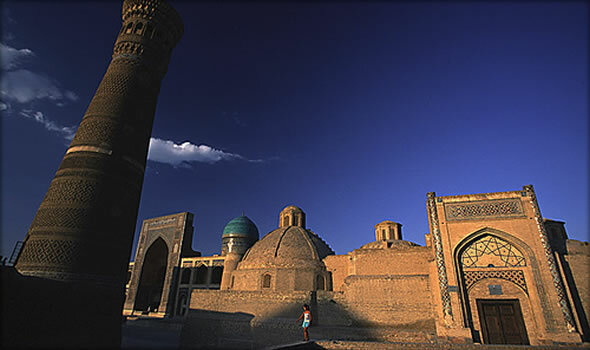 Historically, Uzbekistan is exceedingly rich, making it a truly great tourist destination. 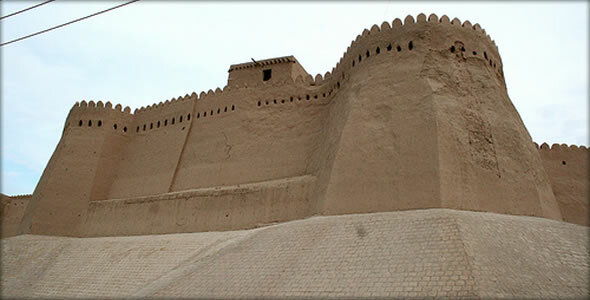 More than 4,000 historic sites dot the country, and thus its stature as the pearl of the ancient Silk Road. Civilization was already ancient here when Alexander the Great conquered the region in the 4th Century BC. Up until the discovery of ocean routes to India and China, Uzbekistan lay at the crossroads of communication between East and West and was the center of trade and exchange of ideas. The conqueror Tamerlane (1336-1405) was born near present day Shahrisabz and created an empire that extended throughout Central Asia to Turkey and south to the Ganges. Tamerlane was also a patron of the arts and transformed Samarkand into a magnificent capital for his empire. Importing artisans from conquered territories, He and later rulers commissioned majestic buildings many of which still stand. Central among them is the Registan, which was the heart of the city. Madrasahs or Muslim religious academies face three sides of the square, giving, one built by Tamerlane’s grandson who also built an observatory which he used to advance the science of astronomy during his reign. Another legendary city is Bukhara, lying to the west. 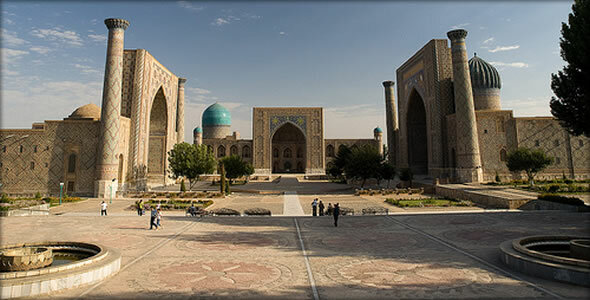 Another oases for Silk Road caravans, Bukhara became one of the great learning centers in the Muslim world and spawned the mystical Sufi sect of Islam. The city today still contains 350 mosques and supports more than 100 religious academies. With narrow streets, many parks and gardens, numerous historical sites and lively bazaars, a visit to this ancient city will satisfy a diverse range of interests. Travel here and you are sure to find something that resonates with your spirit. Further west still, you come to a museum under the blue sky, Khiva. A city reputed to have been founded by Shem, one of the Biblical Noah’s sons, Khiva has preserved its ancient past and been turned into a living record of its days as a key center of trade along the Silk Road. The historic center of the city contains spectacular examples of Islamic architecture. Palaces, minarets and mausoleums from centuries ago have been preserved and refurbished making Khiva a lens through which you can gaze into history.